The exciting new program Be Flex is a drama with a difference. 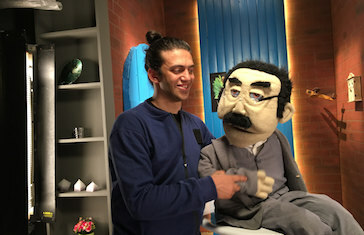 The show stars Abanob Flex, a professional ventriloquist who uses his unique talents to teach families important life lessons. Its engaging and humorous approach is perfect for frustrated parents in need of practical advice. In the show, Flex’s character is approached by his neighbours – all played by colourful puppets voiced by Flex himself. These friends need Flex’s advice, and in each five-minute episode he helps them solve a problem they are facing in their daily lives. By showing the perspectives of both parents and children, the program aims to help family members understand eachother. Beloved entertainer Flex rose to fame on the talent show Arabs Got Talent and is now a YouTube sensation. In Be Flex, he uses his talent for comedy to help families make lasting improvements in their lives. “Humour is the key,” says Flex. “People will laugh and learn. This approach will attract viewers and help them to learn quickly.” During the program, the actor also entertains viewers with his talents for breakdancing and beatboxing. The topics addressed in Be Flex include family communication, managing emotions, and problems at school. Some episodes are aimed directly at children aged 5-12, while others address parents. In one storyline, a mother and daughter clash over a school trip the daughter wants to attend. With Flex’s help, the family reach a solution. In contrast to the authoritarian approach that remains common in the Middle East, Be Flex models balanced parenting based on love, understanding, and healthy limits. The show also addresses wider social problems such as harassment, political instability, and the issues facing refugees. To ensure that the right messages are being shared, the show is written and supervised by Mary Sameeh, a counsellor and Professor of Educational Psychology. Sameeh, who runs a popular counselling Facebook page, will also interact with viewers via SAT-7 ACADEMY’s social media.